Feather Flags and Banners are probably my personal banner favorites and I think you'll understand why after you read on a bit further. I know you have seen them - they are the banners that you see at sports events and festivals. They're usually made of lightweight fabric-type materials and are attached to a frame in some particular design shape...like a tear drop or sail. They are usually anchored into the ground with a metal spike and are flexible enough to wave gracefully in the breeze. They are usually very brightly colored and the graphics are vibrant in the sunlight. When there are several of them grouped together, they will get the attention of onlookers and those milling around the event. They are constructed with polyester material, aluminum framework and a metal spike to hold it in the ground. They even come with a carrying case usually made of lightweight nylon. These feather flags and banners can be designed to meet your needs in regard to the graphics, lettering, colors and shape of the flag. 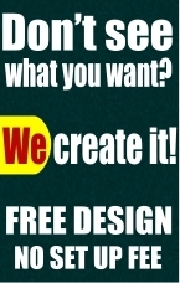 The designs are digitally rendered so the possibilities are literally endless, limited only by your imagination and the expertise of the design department of the banner company you choose. These feather flags and banners can be shaped like the sail on a ship, called a Sail Flag, or they can be designed as an Ariel flag that changes direction with the flow of the wind or the tear drop style can be produced as a multi-function flag printed to be viewed from both sides. 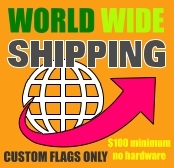 These flags are designed to withstand wind speeds of 13 to 18 miles per hour. The fabric used is knitted polyester which makes it a stronger fabric than the woven polyester used in other applications. The multi-function feather flag is designed with a telescoping pole and an aluminum stand instead of the metal spike for anchoring to the ground. 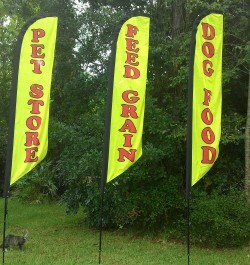 These feather flags and banners can be created totally according to your specifications and needs. The graphic and lettering options are unlimited as are the color combinations used in the graphics and lettering. I am sure you'll find a shape or style that you can use successfully. Remember, several of these delightfully colored flags grouped together will catch the attention of anyone in the area. What will you put on your feather flag?